When buying real estate notes you will surely encounter a seller that flat-out refuses to take a discount. You can try explaining the time value of money until you turn blue in the face or… provide a simple alternative. Offer to buy half the number of remaining payments for half the balance. Not only is the seller happy, the investor can receive an increased yield. Intrigued? Wondering how this all works? Watch this step-by-step video walk through of the 50-50 Partial from our How To Calculate Cash Flows Training. Let’s use a classic example of a $100,000 note at 10% with 360 payments of $877.57 per month. Start by taking the remaining balance of $100,000 and dividing by 2 to get $50,000. Next take half of the remaining number of payments (360 divided by 2) to get 180. The Amount Offered to the seller would be $50,000 for the next 180 payments. Sounds good for the seller but what is the investor’s return? The anticipated yield is 19.98% (or 1.665 x 12 if you are using the HP12C financial calculator). The face rate of the note remains 10% but the investment yield is almost double! How About A 25/25 Partial Investment? This concept also works when dividing a note into thirds or quarters. Let’s take the same $100,000 note and structure buying 1/4 of the remaining payments for 1/4 of the balance. Amount Offered: Purchase the next 90 payments for a 25,000 investment. What happens to the yield? The anticipated yield goes up to a whopping 39.91% (or 3.325 x 12 if you are using the HP12C financial calculator). When structuring these offers be sure to always run a yield calculation. If you have a very low interest rate note you might not be happy with the final yield (even if it doubles or quadruples)! This strategy is also referred to as a split funding, the no discount partial, or half the payments for twice the yield. Technically of course the cash flow is being purchased at a discount from the face rate of the note. But to understand that it takes knowing how to calculate the time value of money (and now we’ve arrived full circle from the beginning of the article). Ready to master the financial calculator for maximum profits? 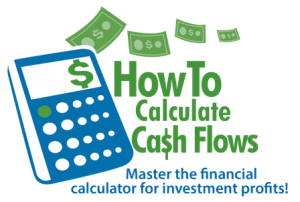 Check out our How To Calculate Cash Flows Training for over 50 step by step videos like the one shared here! This information is provided for educational purposes only. The author and publisher are not soliciting investment funds and this is not intended as legal, financial, or tax advice. This investment strategy might not be suitable for your situation. Always consult with a competent attorney, financial advisor, and/or tax accountant for your protection. I’m curious what to do in a situation where the ‘total payoff’ is higher than the UPB. It seems that this happens when there are a variety of fees that have arisen (late charges and so forth). So, the UPB might be $40K. But, the ‘total payoff’ is $55K. Do we still price the note (and calculate the yield) based on the UPB? Or, do we use the ‘total payoff’ value for the calculations, since that’s the amount of the note buyer expects to receive? If I were to offer to purchase 50/50 according to my calcs I would pay $41,955 for 57 payments, is that correct? I like the 50/50 partial. i see the yiels and understand the calculation. When presenting this to a notre investor what happens to my comm/fee? Hello Tom, You would deduct your fee from the investor’s offer. In the first example where the investor funded $50,000 for 180 payments you would offer something less to the seller. If you desired a $2,000 fee then the offer would be $48,000 tot he seller. If the seller was set on $50,000 and you needed the investor to fund $52,000 then the investor would need to buy a few more payments on the partial. It can take a little playing with the numbers to get the final desired result. How do you not show your commision or fee? Are you actually doing deals like this? love the simple steps on this video. I’m in finance and an educator for 20 years in RE finance and pride myself in using simple language to de-mystify money. And this does that !! Great job. Athena.